Net profit of Hang Seng Bank (0011) for the six months to June surged 137 percent to HK$20.05 billion from a year earlier, beating expectations. 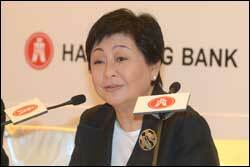 About HK$10.63 billion pocketed from slashing its stake in Industrial Bank during the period buoyed the bottom line. HSB has paid no special dividend from the one-off gain. Excluding the asset sale, profit rose 11 percent, helped by growth in non-interest income and revenue from wealth management business. Net interest margin narrowed to 1.86 percent from 1.88 percent at the end of 2014 and 1.92 percent a year back. A second interim dividend of HK$1.10 per share was declared, bringing the total distribution for the first half to HK$2.20 per share, the same as from a year back. "Instead of squandering the [asset sale] proceeds within a year, we will shore up our capital base so as to continue to develop our core business and capture any new opportunities," said Hang Seng Bank vice chairwoman and chief executive Rose Lee Wai-mun. The lender's total capital ratio rose to 21.8 percent from 15.7 percent six months ago, and its common equity tier-one capital ratio improved by 1.5 percentage points to 17.1 percent, both dwarfing its parent HSBC Holdings (0005) 17.4 percent and 11.6 percent. Chief financial officer Andrew Leung said the ratios need to stay high to buffer against possible regulatory tightening. Business suffered in China, where total operating income slid 5.2 percent to HK$944 million. Weak borrowing demand hassuppressed the bank's NIM, Lee said, and will continue to do so. But the Hong Kong-based lender saw solid growth in its non-interest segment, with net fee income rising 27 percent to HK$3.88 billion from a year earlier, boosted by earning from securities broking and related services, which soared 94 percent. That was due in part to a more active stock market after the launch of the Shanghai- Hong Kong Stock Connect Scheme. HSB shares rose 0.44 percent to HK$159.60.